Mangaluru, Mar 06 2018: In the run up to the upcoming assembly elections in the state, first level checking is under way of electronic voting machines (EVMs) which have arrived in the district, said additional district deputy commissioner Kumar.“First level checking of EVMs began a week ago. It may take us another 10 days to finish the process,” he told media at the DC’s office on March 4, Sunday. 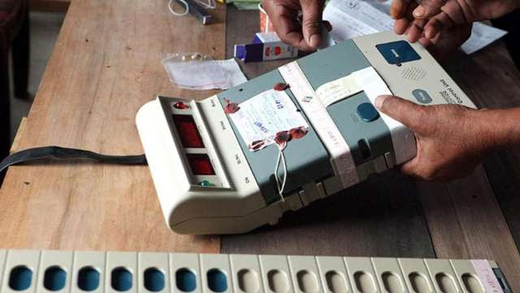 Allaying apprehensions that EVMs could be tampered, Kumar said each machine undergoes rigorous testing that lasts for 40 minutes, and that the testing is undertaken in the presence of representatives from all political parties. “As many as 96 votes (dummy) are cast in each machine and their veracity is established. Only after this do we employ the machine for polling,” he said. In order to further ensure the authenticity of the EVMs, voter verifiable paper audit trials (VVPATs) have also been put in place. The first level randomization of these VVPATs will be undertaken shortly,” Kumar said. “After a voter casts his vote, the VVPAT placed adjacent to the EVM will capture the details and display the symbol of the party that the voter has chosen, so that he/she is fully convinced that the machines are not doctored. The VVPAT will display the symbol for seven seconds, during which a print of the same will be generated. However, the print will be kept only for records, and will not be handed over to the voter. In case the voter has further apprehensions, he/she can appeal for a fresh vote, which will be considered with terms and conditions,” said Kumar. To help voters with queries, the district administration is in the process of setting up a dedicated control room on the second floor of the DC’s office near the State Bank bus stand. Kumar said a separate toll-free number, in addition to the existing 1077 helpline, will be made available, through which voters can clarify their doubts. “The helpline will be functional round the clock. A team to be employed at the control room is being set up,” he said, adding that the helpline number will be released shortly. Going a step ahead, the district administration has also created a website, www.deodk.com, to ensure that all queries that a voter may encounter at any point of time are answered. The website that is already functional, provides in-depth data on all the constituencies. Kumar said to ensure that no physically-challenged voter is deprived of voting, village accountants have been tasked with the responsibility of identifying such voters. A total 2,284 physically-handicapped people in the district are enrolled in the list. “Another 262 voters are to be enrolled,” he said. To check for complaints and ensure that names of people in remote villages are not left out, the district administration constituted special teams, called, village-level electoral teams, at the booth level. Each team comprises the respective village accountant, a high school teacher and an anganwadi worker, Kumar said.